Seven years after the release of the full-length album "Graceful Murder", the Kyiv-based death metallers Flying presented a new single "Obey and Trust". 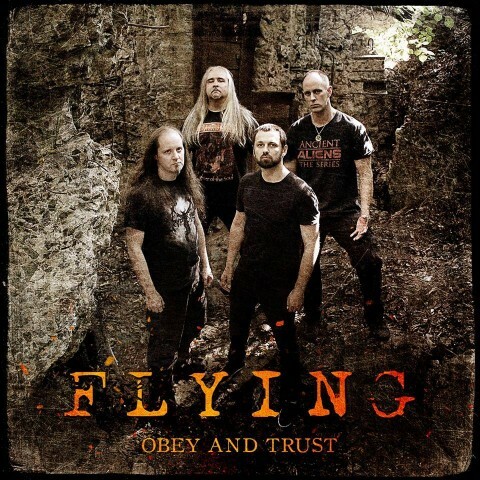 The recording process, including Flying’s Victor Ozolin (vocals), Max Nabokov (guitars) and Alexander Kasiarum (drums), also featured Mike Poggione (Monstrosity, Vile, Trivium and Skinned) who recorded a bass part for "Obey and Trust". Mixed and mastered by Max Morton (Sectorial, Jinjer) at the Morton studio. "Obey and Trust" artwork was created by Nurgeslag (Rotting Christ, Balfor). Photo by Xenka Sequoia.